Hmmmmm. Didn't post yesterday. I thought about it, but that's as far as it got. It was busy yesterday. I had to go back into the city to finish servicing some instruments at the University of Chicago. But that didn't turn out well as my contact was unavailable. He's always said I never have to call first and has, on one occasion, been slightly irritated that I called him first before leaving the office. "No no. I'm always around. Just call when you're 10 minutes out." Um.....and if he has an emergency to handle, which he did yesterday, that left no one to let me into the instrument locations until noon. As this was 9:10 and the only thing I had to do in the city, that's not an optimal time frame. Oh well. Back to the office. I have bids to get out anyway. It was a beautiful morning yesterday. Clear, sunny, with a calm lake. I drive north on Lake Shore Drive and am reminded why I like living here. This was taken last year, in August, I believe, but the same view was had yesterday. Chicago is a very dynamic city. There is always something to do here, even if I don't take advantage of it. It's also very pretty. For all his smarmy-ness, Mayor Daley has seen to it that Chicago retain landscaping that befits a major city. There are planter boxes in the center of boulevards. There are parks everywhere. To the right is the Museum Campus area where the Field Museum and the Shedd Aquarium share a large open space of green. 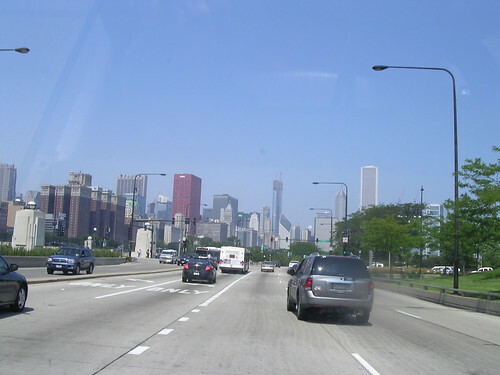 The first time I came to Chicago, with my family in 1973, Lake Shore Drive ran between the Field Museum and the Shedd. You accessed either via a tunnel under LSD. This tunnel was well known as a place for street musicians, gangs and "Oh lord! What's THAT smell?" One of Mayor Daley's first big urban projects was to relocate northbound Lake Shore Drive west of the Field Museum and turn the former street into a large green area. I think it's the lushness of life in Chicagoland that keeps me here. I have no family here. And, realistically, with Carole happily ensconced in the Seattle area, no real reason to stay here. But I love 4 distinct seasons. I love visiting my friend who lives near Wrigley Field. I love the museums, the music, the potential, if you will. And that is what keeps me here. Blue skies. Warm sunshine. Green grass. A chance to drive with the top down and the wind in my hair. I gotta get rid of this cold.